In this day and age, we are all more and more sensitive when it comes to opening our front door. We might fear for our safety, or simply not want to be bothered. And once you open your front door, there is no turning back. But what if you could see who was at your door, without having to leave your living room? What if you didn’t have to run to the door every time the neighbourhood kids rang your doorbell? That is where video doorbells and their monitors come in. Who Wants a Video doorbell? What are these “video doorbells” and how do they work? These gadgets work simply, but extremely effectively. A small camera with a button is mounted as your new doorbell. This camera records everything that is happening out side your door. Inside your house, that camera is connected (wirelessly or with wires) to a monitor screen which displays what the camera is seeing. This monitor not only displays what the camera sees, but then allows you to talk back through the monitor to the guest outside your door. It’s a visual intercom, and doorbell all in one! The monitors can be mounted where ever you like. You could put one in your bedroom, maybe in the living room, or maybe even the kitchen. It’s up to you. Where ever is more convenient for you, you place the monitor there and answer the door from that monitor. Many video doorbell systems even come with multiple monitors to place in different areas of your home. This way you can know who is at your door wherever you are in your home. I think we all want a video doorbell. They are cheap and easy to install. You have everything to gain and nothing to lose! If you are security conscious, or live in a rough neighbourhood, you want to know exactly who is on your doorstep at all times. You want to know that you and your family are safe, before opening the door. These video doorbell monitors could save you from opening the door to a potential criminal! Or maybe you are elderly or infirm. These monitors mean you can see and speak to people at the door without having to walk across your house to open for them. It will save you time and energy. Video doorbells with monitors also provide a solution to the problem of not owning a smartphone. Other doorbell systems connect a camera to your smartphone, requiring you already have one. For those of us who don’t have or wish to use a smartphone, a video doorbell with a monitor is the better solution. It’s simpler too! 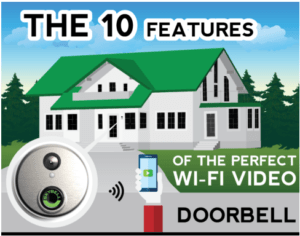 You don’t need to connect up your smartphone or your wifi connector to be able to operate a video doorbell with a monitor. It provides you with the security you want without requiring you go out and buy a smartphone. Video doorbells and their monitors make a great addition to your security system and your home in general. Know who is outside and speak with them freely from the comfort and luxury of your home with peace of mind. What are the pros and cons of video doorbells? Here’s a comprehensive list to help you compare other systems with monitor video doorbell systems. Pros. Firstly, video doorbells and their monitors are very affordable. You wont need to break the bank to purchase one! They also provide peace of mind of not only being able to see but also speak with someone at the door. Something CCTV and other camera security systems don’t include. And they provide the viewing monitor device for you! No need to purchase a smartphone or other screen separately. It is all included in one package. These monitor include camera doorbells also provide stronger security of the system itself. Because the monitor and the camera are hard-wired together, to crack, it will require on-sight physical access, opposed to cell phones and other wifi systems which can be downed by simply cracking the wifi signal. Cons. The system relies on you being inside the house to answer the door and near a monitor. Smartphones and other devices do not connect to the doorbell camera or intercom system. So if you are out of the home, you won’t be able to answer the door. Physical wires and monitors need to be installed, which can take more setup time than a smartphone connected system. Make sure you have a spare hour or two to setup and check the entire system works. To be sure to pick out a video doorbell and monitor system that fills all your needs, you will want to make sure it checks all of these requirements. These will insure you know exactly what you want included in your video doorbell and monitor purchase. Firstly, it is very important to get a good monitor screen. A screen 7 inch or wider is generally perfect but you wouldn’t want anything smaller. This will insure you can see everything going on without having to squint or strain your eyes. You’ll also want both the camera and the monitor to record and display in high definition. Full colour is also very important to provide an accurate image of what is happening on camera. Night vision will also allow you to operate your video doorbell and its monitor no matter the time of day or the weather conditions outside. A system that doesn’t have night vision is only half a system because it only is useable for half of the day. So make sure to always get night vision included on your video doorbell system. You will also want to make sure your system is waterproof and oxidation-proof to stop your camera and entire system from wearing out too fast. This will save you money in the long run. Below are a number of reviews of different video doorbell systems that include monitors. This list compares different priced options and different types of system. Video doorbells are wonderful, but what is even better? Wireless video doorbells. The TMEZON video doorbell though is not only wireless, which means no hassle of an extensive installation, but it also connects to your smart phone! Every time someones at the door, your phone is going to call you. But say you don’t want to wire it up to your smart phone, the TMEZON monitors are something from a science fiction film. They are elegant and stream line at their 7 inch length, providing a beautiful HD picture at 1200 TVL (that’s good). And don’t be content with just one video monitor, you want more. TMEZON provides four indoor monitors, that means enough for every corner of your house. No matter where you are, you’ll be able to run to a monitor and see exactly who’s at the door in a moments notice. What’s more, the monitors record every time someone approaches the door. This is because of motion sensors on the doorbell camera. So with an SD card you will see every person and squirrel who knocks on your door step when you review your footage later. And everything is durable too, waterproof, dust proof, anti vandal. You name it, this thing will withstand it. This is top of the range video camera doorbell technology, the beautiful set up that we all want. The buttons on the monitor are touch key too, adding to the stream line feel. I recommend this system to everyone who wants the best and the beautiful when it comes to monitors and doorbell cameras. But you won’t need to use the buttons much, most of the system is fully hands free! It is a great deal, and provides the luxury video monitoring of your door that you want. For those who want the luxury of a video doorbell system but for as little cost as possible, the WOLILIWO Video Doorbell is the one for you. With HD camera and full colour monitor, you won’t miss a single thing going on outside your door! The nine-inch monitor not only displays in full HD and colour, but it also has night vision too! And I love the size of this monitor. It lets me see much clearer everything happening outside. Ringtones and brightness can all be adjusted on the monitor it’self, so it will adjust to however you want it. No more annoying built in ringtones. But what if you don’t want to have to run to the monitor every time you hear it ring? WOLILIWO video doorbells come with the option to buy extra monitors as well. So you can mount three in separate locations. One in the bedroom, one in the living room and one in the hall, or wherever you want it! And there you go, no more hassle of running to the door. The luxury we all want! One of my biggest hassles in life when it comes to video doorbells and their cameras is the fact that I live next to the sea. And we all know the sea does hell to most of these gadgets. But not this one! Not only is it waterproof, it’s oxidation proof as well. Which means that it’s not going to collapse to the elements nearly as fast as the other cameras and monitors out there. Overall, it’s a lovely display, and it’s great to adjust to how you want it. HD, night vision, and multiple 9 inch monitors, it’s luxury at a cheap price. Perfect for those of us who want these HD monitors without breaking the bank. Most of us today are hesitant to open the door to just anyone. We want to be able to see who is at the door while keeping ourselves at a safe distance. Whether it be from that one neighbour who asks every second day for a cup of sugar, or those pesky kids who are messing with our doorbell again. And of course, we all want to be safe from those who want to cause us harm. The 1byone video doorbell is simple to use and easy to install. And it covers all bases. The monitor system is perfect to be able to watch whoever it is at your door from the safety and comfort of your home video monitor outside the doorbell. And it’s camera is waterproof. It’s also shielded with an aluminium plate that will stop anyone trying to vandalise it. The video monitor is beautiful and elegant and sit’s on the wall nicely. And this monitor can be wired to be just about anywhere! The video monitoring system is of perfect size to fit on just about any wall. The monitor connects with two wires straight to your doorbell and its camera with a maximum distance of 100 meters! I love the reach you can achieve. Even from an upstairs bedroom I can, with a push of a button, view everything happening on the front porch. Even at night, it still works perfectly with it’s infrared LED projection, meaning there is no need to have to install extra lights outside your door. And with its extra buttons, it’s possible to wire it to an electric gate or door as well. So when it’s raining, we don’t need to walk outside to get the gate! If you are out for most of your day like I am, you will want to be able to come home and view with peace of mind everything that went on outside your door. This is why I love the fact that 1byone video doorbell allows for an SD card. The card quickly slides in and records everything for later viewing. This product is perfect for anyone who wants to keep an eye on their door step from the comfort of their couch; with quick and easy setup and not much hassle. 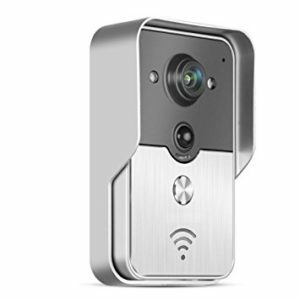 Though far from the best when it comes to doorbell camera systems, AMOCAM is cheap and easy to operate. It might be what you want if you are looking for a cheap solution. This doorbell camera system will allow you to see exactly who is at your door with a 92 degree angle view. You’ll never have to worry going to open the front door again. If you don’t mind the fact AMOCAM doesn’t record footage or link to a phone, this doorbell camera and monitor might just work for you. With a nice 7 inch monitor screen that displays in colour and has built in night vision tech, you will be able to see and speak to guests outside from the safety and comfort of your living room. For me this is all I could want, with no real need for anything fancy. The LDC monitor screen is easily adjustable to different brightness, colour and contrast levels. And you can choose between 16 different chimes for the one you want. Along with this the monitor is hands free and auto turns off, so no need to learn finicky buttons to operate the device. You also have the option to purchase two monitors, so you are able to operate the intercom from two seperate locations, great for double stories or those who don’t want to run to the hall way to get the door every time. But I’m not going to lie, the AMOCAM is not high tech nor made of durable materials. But for almost half the price of most other video doorbells, you get what you pay for. For those elderly, or those not exactly tech savvy, it is easy to operate after installation. So you’re looking for top of the range video doorbell systems? Well then you’ve found what you are looking for with the MOUNTAINONE video doorbell and camera intercom system. We all want to have the peace of mind that camera doorbells bring, and MOUNTAINONE goes beyond that. With night vision you will be able to check on your door at any time, day or night. And the 7 inch high resolution screen means you wont miss a thing coming through the HD camera lens. The camera is water proof and oxidation proof, perfect to protect it from anything the elements will throw at it. Which where I live, is a must for any electronic system to survive longer than a few weeks. This system is durable and effective. And what I love even more: it looks beautiful. This thing is streamline and fashionable in it’s dark colours and touch screen technology. The monitor blends wonderfully onto any wall and looks like a feature rather than a gadget. And what’s more, the two 7 inch monitor screens not only interact with the doorbell and it’s camera, but with each other too. 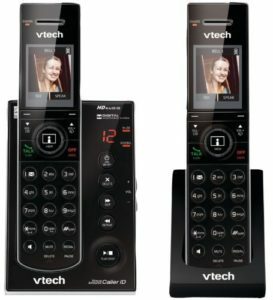 This makes the MOUNTAINONE system much more than a intercom with a camera; it connects your entire house via audio visual. This system is great for you if what you want is luxury design and the peace of mind that it’s security brings. You will never have to worry who is at your door again. A touch of a button and you can see and speak to who ever is there. This is the security system we all want. A cheap and durable solution to the problem of “who’s at my door now”, the ANBOSON Video doorbell has everything you need at a very cheap price. Though, it lacks some of the fancy gadgets that more expensive doorbell cameras and their monitors include. But what it does do, it does well. The ANBOSON’s monitor screen is 7 inches wide. This provides a high resolution image from the HD camera set up at your door, letting you see everything. The monitor is completely hands free when using the camera and intercom, and is easy to operate and adjust the settings. Though a word of caution, the manual is unclear on somethings at times. But it’s setup and settings is mostly common sense. When at first I heard how it was completely plastic and at such a low price, I thought it couldn’t be any good. It works well and is surprisingly strong. And it has all the essentials: night vision and audio & visual two way communication. Though it doesn’t record for later viewing. But if you aren’t interested in reviewing footage anyways this will work for you. I would recommend this as a cheap but effective system, and will work for anyone who wants the basic video doorbell system. And it’s easy to operate for those of us who hate pressing lots of buttons. Overall a great value for money purchase, better than other products in it’s price range. It only has one real hiccup which is the fact that the four pin cable is very short. And it can only handle one monitor. But if you are okay with placing only one monitor near the door, this should be no problem for you. With some extra cable this problem can be solved as well. And besides this the product is perfect and one of my favourites.